We offer the Higher Quality, Higher Grade 16" (inch) "7 Function" L.E.D. Foam Sticks. These obviously have better L.E.D. interior parts and a better lighting effect as well as they are the most durable and re-usable. Batteries are also replaceable on these. These 16" LED FOAM STICKS are more common for Weddings and Corporate Events, 16" Foam Stick 7 Function are higher in quality. 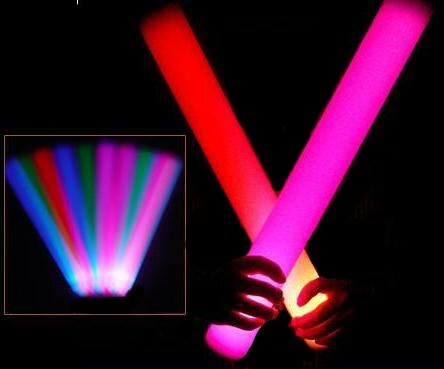 and the High End of LED Foam Sticks. PLEASE READ BEFORE ORDERING, Our PRINTING METHOD has been Changed for the BETTER! Had a glow in the dark/led slumber party for my set of twins, and these were the highlight of the party! They used them for so many things! At the selfie stand, while pillow fighting, dance routines! The fun with these wee endless! I would recommend this company, I got my money's worth!